Bill: How are you at solving go problems? What does it mean to solve a problem? That's not so easy to say. Bill: Here is an example of what I mean. I ran across this problem on a web site recently. It is a well known problem, and I recognized it. I quickly saw the following solution. is the vital point. makes bent four in the corner. But the site gave a different solution. Bill: The end result is the same, differing only by the order of play. Bill: I think that this is a real question. You could say that I did not solve the problem, because I did not read out the solution sequence. OTOH, the key play is the same, and the rest is obvious. If had been at , the play would have been obvious, too. To solve the problem, do I have to read out every stupid sequence of play? Besides, and go together, as do and . Changing the order of Black's play really does not matter. Bill: But wait! There's more! (See below). Bill: Did you see this line of play? I didn't. looks silly, and is the "obvious" response. But it allows Black to live by oshitsubushi. Velobici: Solving means reading all possible sequences and knowing their results. (At least that is my understanding from professional players.) Is a good play? It appears to either give White an eye in the corner or allow White to split Black. White 3 at a does not appear to me to be the obvious response. preserves White's straight shape?, threatens to create an eye for White, and threatens to split Black at b.
Dieter: To me, solving a problem means finding all possible solutions, knowing all refutations of moves that deviate from these solutions and their outcomes, and if possible find the most preferable of the available solutions, or the circumstances that will give preference to either solution. That is definitely much more than just seeing the solution diagram, or often, feeling which line of play the composer has in mind. jfc: I think this is one reason why young insei's get problem books that do not have solutions in them. If the only solution you are going to see is the one you work out on the board your self then you tend to be more dilligent in the play it out on the board phase (if not during the thinking it through phase). I have considered creating a tsumego training program that would test the user on all interesting variations of each problem before considering it solved. It would also time how long you take to respond at each move and a long delay would be considered a failure. It would also analyze all sorts of interesting statistics in an attempt to train the user on his weaknesses. In the end I decided it was less work to simply follow the advice of pros and substitute playing the solution out on a board for looking at the book solution. If, by testing all the sequences you can think of out on a board, you can not convince yourself that you now know the solution (whether or not you discovered it just by thinking) then you have also learned something about the limits of your current ability. The thing you want to avoid more than anything else is thinking you know the solution when you do not. I have seen many problems at the edge of my ability to solve for which I found the main line book solution (back when I was looking at them) and thought I had solved the problem only to find varations that stumped me for a while (e.g. I would have failed if I was in 30 second byo-yomi). Dieter: The grey zone starts with the words "know" and "find". At some point, you allow yourself to stop branching and reading because you know you know. Here: I don't calculate, I simply know. Beginners should know. I know kills. I don't have to read this out. I know I will kill this group, even against Cho Chikun. I have complete confidence in every possible variation. I also know that under most circumstances, this is the best way to kill this group. Yet, I don't see all variations at a glance. A dan player should be able to do this. A beginner, however, must solve the problem. jfc: not only can a dan player kill Cho's L-group, he can do it at blitz go speeds. If you have to stop and think for more than 5 seconds then you don't know the answer. The exhaustive reading Bill mentions above helps train the mind to recognize when it knows something and when it is confident but not sure. Anon: Maybe I'm misreading, but I think this is only a guarantee locally. If black plays a, white must play b, then black plays c, white must play d to kill. Black can then attempt to escape on the left side. If the rest of the board is empty, this will fail, since white can chase black to the lower-left corner. But if black has support on the 2nd line, the escape is successful. If you're playing blitz against Cho Chikun, he can play elsewhere for now, but a long time later find an opportunity to innocuously play support on the second line. At blitz speed you probably won't think to go double-check the deadness of a distant L-group, and then he'll get to save it. Dieter: Maybe I must re-solve the problem and catch all alternatives, then come back to my statement that is the best way. As for your example, Bill, the order of play is covered by your knowledge of miai - but then again you can be "unlucky" sometimes. And the alternative for , you can account for by your strength. At my level, I would have gone through these variations. Have I therefore solved the problem in a more complete way? No, your cut-off point is a little higher, that's all. Dieter: Perhaps, if you miss 1 in a hundred problems of the same level your real accuracy is not 99%. fractic: I think this is an interesting point. If I would run across this problem I could probably find Bill's first line (probably thinking it's a seki). I'm quite sure I wouldn't pay any attention to such an "obviously bad" play as the 1-1 point. But as has been pointed out I should have considered it. jfc: no, Dieter is right. It is not vital that you had considered the 1-1 point variation. What is important is, when presented with the 1-1 move, did you immediately know the counter move or did you have to think. Perhaps when your opponent plays the 1-1 move you even have a brief moment of panic that you misread the problem before you realize the proper response. I guess the way to say it is that the knowing does not need to be at the conscious level but it does need to be accurate and complete. I still think my blitz rule is a good test of whether your combined conscious and subconscious knows the solution (e.g. 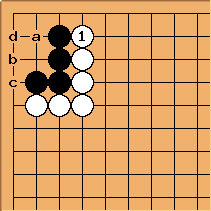 Dieter's Amateur dan player verses Cho Chikun's L-group example). fractic: But this leads to another problem. If this problem is in a book it will need a solution diagram. This will probably the diagram showing the bent four because that is the idea behind the problem. But is just that solution diagram enough? Shouldn't there be the failure diagram that Bill posted aswell? And at least a note on the proper solution. Not to mention failure diagrams for other first plays? Allthough I haven't read much go books, but from my experience there are usually only one or two diagrams with solutions and failures. Perhaps a solution should also contain a note saying "have you considered at the 1-1 point?". This problem also exists on goproblems.com. For some reason solving problems at GP invites me to do less reading and just clicking once I have a good hunch. Let's suppose this problem was on GP and I were trying to solve it. I would probably think a while and play at right point. Now the applet would probably respond in a way that leads to the bent four solution. This way I would never even realise the other variation. Of course the applet could respond at the 1-1 point but then I wouldn't see the idea behind the problem.